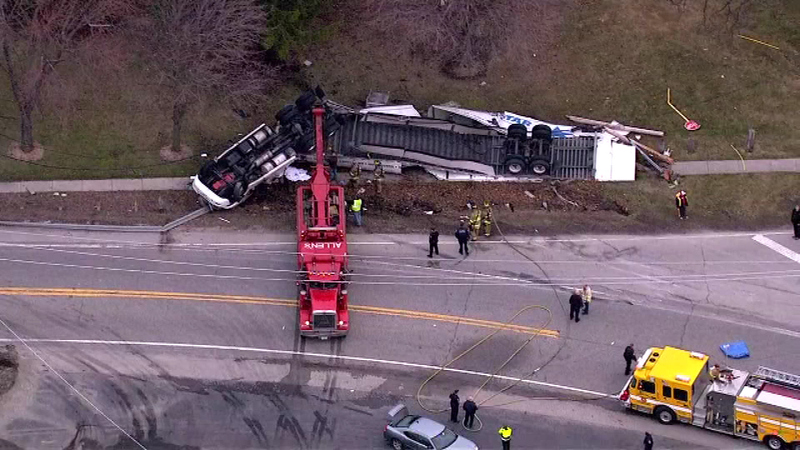 PINGREE GROVE, Ill. (WLS) -- A 12-year-old girl from South Bend, Ind., was killed when a semi overturned on U.S. 20 near Pingree Grove, Ill.
Dahabrielle A. Turner was pronounced dead on the scene. Her father, Dior L. Turner, was driving when he lost control of the semi on a curve near Reinking Road just before 5:30 a.m. The truck, which was carrying a flammable liquid, hit a guardrail and knocked down some power lines. Dahabrielle was ejected from the truck. Her father was taken to Elgin St. Joseph Hospital; his condition is not known. U.S. 20 was closed to traffic as authorities from Pingree Grove and Kane County investigated and cleared the wreckage. Heavy equipment was brought in to upright the semi. Anyone who saw the crash is asked to contact Pingree Grove police at (847) 464-4600.